17-Oct-2009 -- On a weekend visit to Chiangrai Suree Bhumibhamon took me sightseeing in the surrounding areas of Mae Sai on the northernmost border to Burma where cheap Chinese commodities proliferates and to Chiang Saen with its enormous new golden Buddha on the bank of the Mekong River opposite Laos. Unfortunately we did not have time for a visit to the Opium museum, that will have to be for another time. But on the return southwards towards Chiangrai we found just enough time to look for the confluence point. We had a basic tourist map and headed, south from Chiang Khong to Ban Mae Bong, then on to road 1173 which brought us to Ban Dong Tawan and an area with rice fields where the car could not easily go. We parked about 1,6 km from the cp. Two motor cyclist came along. They had been out checking the state of the rice crops. We hitched a ride with them, first to a point where it was not possible to go the remaining 800 m, then leading us to the village and on to a small road taking us to a point where it was just over 100 m to walk. 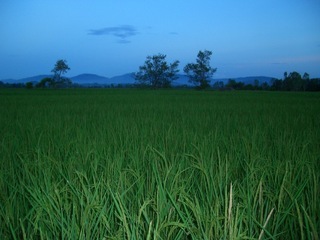 We balanced on the mounds between the rice fields and settled for a distance of 18 m from the cp. The sun was going down and we hurriedly took the relevant photos. (Time shown on the GPS is Central European Time, i.e. just before 6 pm local time).